Discussion in 'Star Trek - The Original & Animated Series' started by ZapBrannigan, Feb 12, 2019. 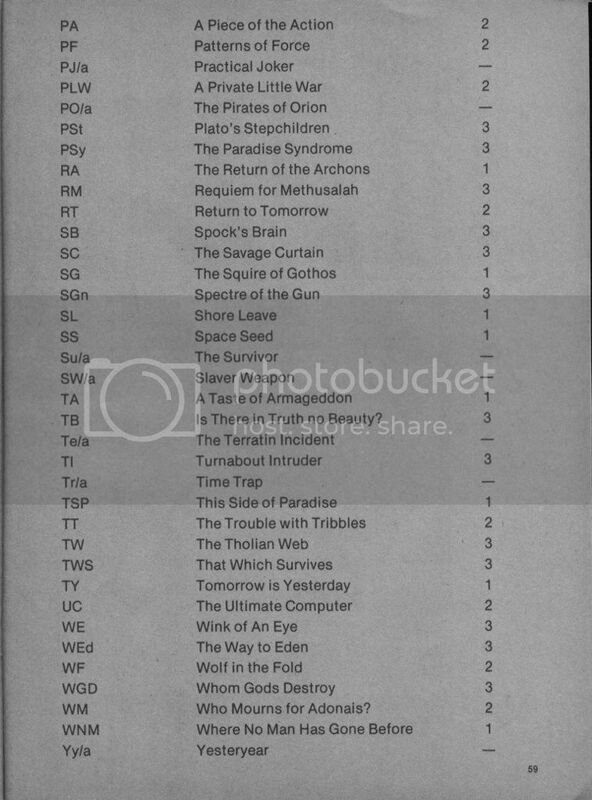 ...You can recognize TOS episode titles from abbreviations, like COTEOF, WNMHGB, or FTWIHAIHTTS. 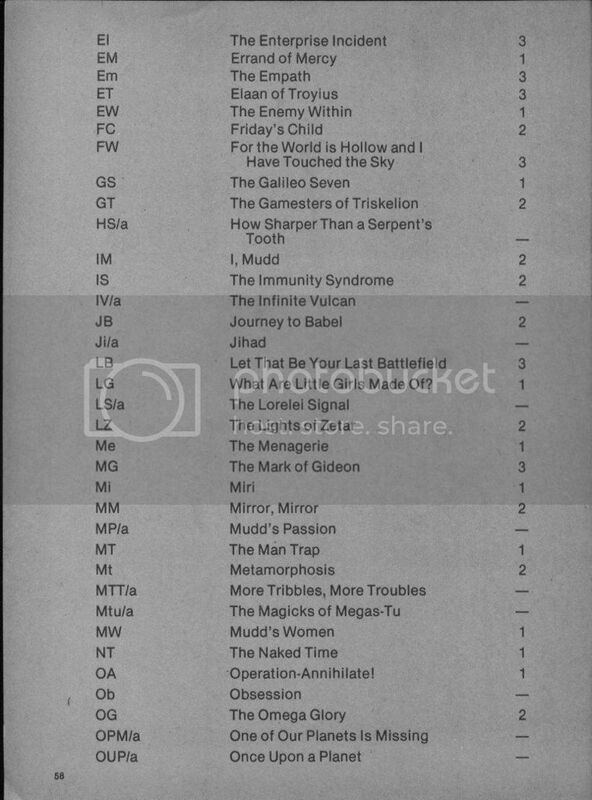 That reminds me: the Star Trek Concordance (1976) gave us a standardized abbreviation for the title of every episode. The value of these particular abbreviations was not that they were ordained by Landru, or are somehow "perfect." Their value was in being part of our common language, codified and set out for everyone to see. And they're shorter than the no-system abbrevs. Most serious ST fans had the Concordance in hand back then, and it became an accepted convention among us. It just made sense. It made communication more efficient, which is part of what the Periodic Table does for chemistry. I'd rather just type out the full titles than have to look up those abbreviations whenever I want to discuss a particular episode. Sgt_G, Greg Cox, johnnybear and 3 others like this. You'd be surprised how fast they stick in your memory. Sgt_G, 1001001, JonnyQuest037 and 3 others like this. I guess it's media-dependent. Today, we have no desire to save ink with abbreviations, but saving keystrokes is still a thing. Yet what we primarily want of the episode title now is connectivity: how does it best lead us to the source? My gold standard for episode abbreviations would be the ease of googling. If you type in "chakoteya + X" where X is a single word, can you home in on the correct online transcript page? Say, "chakoteya errand" is unambiguous, as is "chakoteya survives" - but "chakoteya which" doesn't give you the desired return even though that, too, ought to be unambiguous for that latter episode. Makes the messages rather incomprehensible to newbies. Sgt_G, JonnyQuest037 and BillJ like this. Those abbreviations are just dogshit man. I'd rather type out in the full title in inverted commas, much more civilised. Solves the "VOY or VGR?" and "DSC or STD?" problems, too. I dno man, I prfr to jst rite out all the wrds. Its jst esyr. Greg Cox, JonnyQuest037, Kor and 1 other person like this. Any "serious ST fan" these days has trained their autocomplete to predict the full title while typing so there's no need for this. Tim Thomason, JonnyQuest037, Kor and 3 others like this. No, those abbreviations are beyond stupid, way too complicated. Abbreviations make sense for extra long titles but in that case just drop part of it, "For the world is hollow ..." for example. But what's the point of abbreviating Miri? Sgt_G, Greg Cox and BillJ like this. I already commit a significant amount of my brain to Star Trek. No room for episode abbreviations above that. Greg Cox, Phaser Two and Bry_Sinclair like this. You just don't understand the love of standardization and strict formatting. It makes everything fit. It gives every episode one uniform rule. It's a system. Hell, to me too. You'd think working in the aerospace defense industry I'd be able to handle acronyms well, but a Trek title acronym usually makes my brain screech to a halt. I'll use TOS as soon as "The Original Series" appears in the title card on each episode. Until then it's ST.
nightwind1, Forbin, johnnybear and 1 other person like this. i have a degree in Computer Science and still write programs from time to time. So yes, I understand and appreciate standardization and strict formatting: It goes with the CS territory. However, i also understand the need for communications to be as clear as possible. So I won't be using these abbreviations* because they don not clearly convey the associated episodes. I will usually use the common practice of stating the full name at least once followed by the acronym I intend to use. For example, Court Martial (CM). lawman, Greg Cox, J.T.B. and 2 others like this. I would suggest that the "/a" is unnecessary for the animated episodes. Just giving it a cursory glance, I couldn't spot any that would easily be mistaken for the abbreviations of live-action episodes. I'm trying to learn Russian and having an easier time of it than I am with those acronyms. I think it was an admirable effort (and an admirable suggestion by Zap) because some of the episode titles are long and complex. And it probably worked internally for the Concordance. (A masterwork, by the way.) But for now, I think each poster using his own system is fine. I usually abbreviate only when needed and if anyone's ever had a comprehension issue with my posts, they've failed to let me know. Similarly, I can't remember the last time I read a post on here and couldn't dope out to which episode a poster was referring. lawman, Marsden, BillJ and 2 others like this. 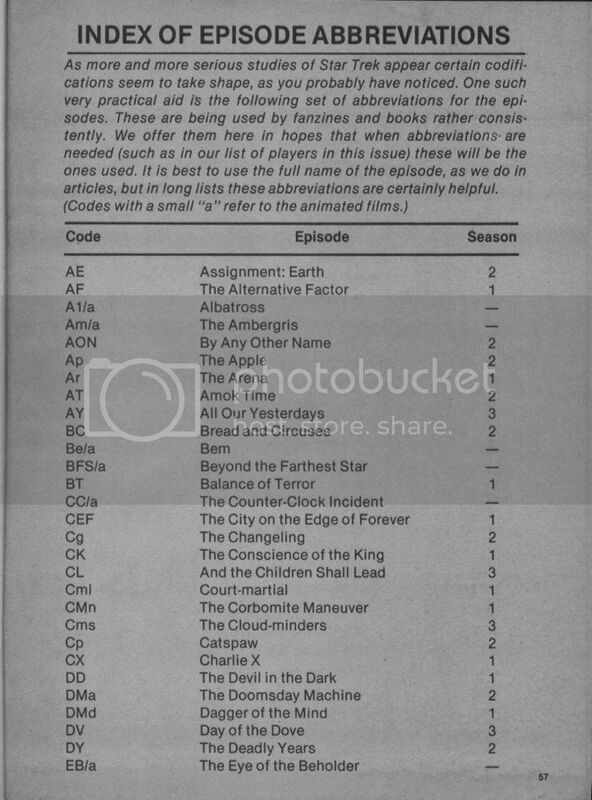 The list as printed and shown in the image seems to have a typo right near the top...I'm sure that the abbreviation for "The Albatross" is meant to be Al/a, but they've got A1/a. ZapBrannigan, Phaser Two and BK613 like this.